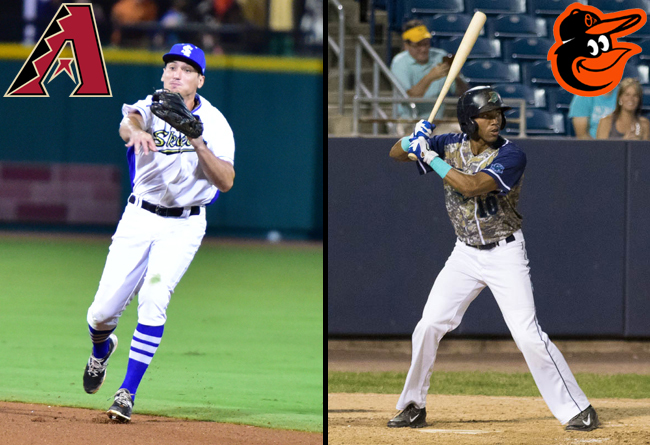 (Sugar Land, Texas, Jan. 10, 2018) - The Sugar Land Skeeters announced that infielder Josh Prince and outfielder D'Arby Myers have been signed by the Arizona Diamondbacks and Baltimore Orioles organizations, respectively. Prince played 127 games with the Skeeters during the 2017 season, accruing a .263 batting average, 11 home runs, 52 RBI, 75 runs and 24 doubles. He also led the Atlantic League with 55 stolen bases, shattering the club's single-season record and moving into sole possession of first place on the team's all-time stolen base list. The 29-year-old also ranked second in the league with 85 walks and was named a Post-Season All-Star while simultaneously earning Team MVP honors. The Louisiana native played 93 games with Sugar Land during their Championship-winning season of 2016 and appeared in 66 games with the Bridgeport Bluefish in 2015. He previously spent the first six seasons of his career in the Milwaukee Brewers organization, reaching the Major Leagues in 2013 where he played in eight games. He began the 2015 campaign with the Erie SeaWolves (AA, Tigers) before joining the Atlantic League. Prince was originally drafted by the Brewers in the third round of the 2009 amateur draft. Myers, whose Atlantic League negotiating rights were obtained by the Skeeters in the Bluefish Player Disperal Draft last October, was the league's batting champion in 2017 with a .337 average. He ended the year with three homers, 43 RBI, 63 runs, 21 doubles and 31 stolen bases over 96 games played. For his efforts, he was selected to play in the Atlantic League All-Star Game for the Liberty Division, and he collected two hits in three at-bats during the midsummer classic. The Los Angeles native spent the 2016 campaign with the Southern Maryland Blue Crabs, hitting .280 with seven homers, 44 RBI, 42 runs, 13 doubles, five triples and 29 stolen bases in 102 games. Before joining the Atlantic League, the 29-year-old spent seven seasons in the Philadelphia Phillies organization and two with the Oakland Athletics and one with the Los Angeles Angels, reaching as high as Triple-A with the Angels in 2015. Myers was originally drafted by the Phillies in the fourth round of the 2006 amateur draft.